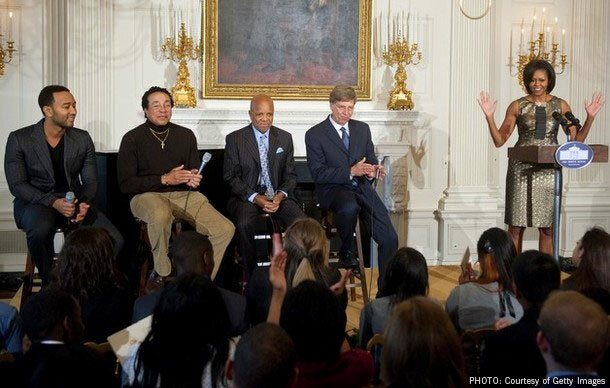 On February 24, 2011, The White House welcomed 120 students from across the country to celebrate the music of Motown when they hosted The Sound of Young America: The History of Motown in the State Dining Room. The hour-long program, introduced by First Lady Michelle Obama and co-produced by The GRAMMY Museum's education department, featured Museum Executive Director Bob Santelli giving a brief history on the label followed by a question and answer session with Motown founder Berry Gordy and musicians Smokey Robinson and John Legend. The program ended with lively performances by Legend and surprise guest Nick Jonas of The Jonas Brothers. The event was produced in cooperation with "The Motown Sound: In Performance at The White House", the latest in the on-going White House music series airing on PBS. In the days prior to the program, students from Los Angeles, Chicago, Cleveland and Detroit were given special tours of The National Archives and The National Museum of American History as well as allowed the opportunity to watch rehearsals for the evening concert. "The Sound of Young America: The History of Motown" marks the second time the GRAMMY Museum has been invited to The White House to celebrate Black History Month, first traveling to Washington, DC last February to produce the special "In Performance at the White House: A Celebration of the Civil Rights Movement" and the education program "Music that Inspired the Movement". Watch the video of The Sound of Young America: The History of Motown program.